The pair holds bullish tone on Monday, boosted by fresh risk mode and focuses 2019 high (112.13). Bulls attempt to clearly break 200WMA (111.97) that would generate positive signal for extension of recovery leg from 104.59 (30 Dec spike low). 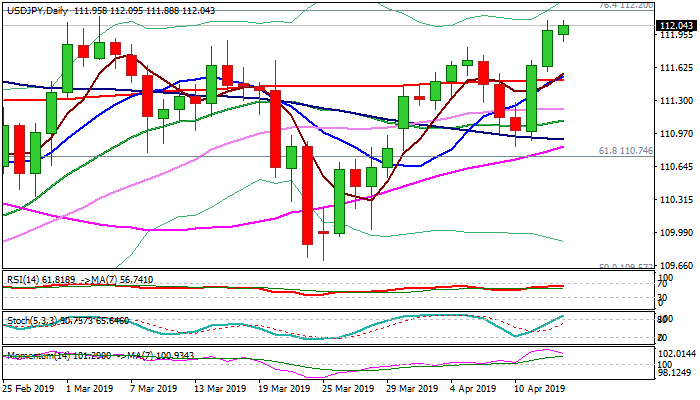 Two long daily bullish candles (Thu/Fri) underpin the action, but fading bullish momentum and overbought stochastic on daily chart suggest that bulls may take a breather before eventual break above strong barriers at 111.97/112.20 zone (200WMA/2019 high/Fibo 76.4% of 114.54/104.59 fall). Broken 200SMA (111.51) marks solid support which should contain corrective dips and maintain bullish bias.